The holidays are finally here and the last thing I can think about is shaking my healthy finger at anyone. I haven’t come up with a “topic” for this week, but I still wanted to share something with you before I take a holiday hiatus. Here is a wonderful, seasonal recipe for ginger pear cake, using health(ier) ingredients than your standard bakery version. I found the original recipe on a seasonal Ontario food blog (http://seasonalontariofood.blogspot.com), which is a great resource for anyone living in the Toronto area, or those in similar climactic zones (Copenhagen counts). I have made a few small changes to make an even healthier version, but I promise that you won’t know the difference! 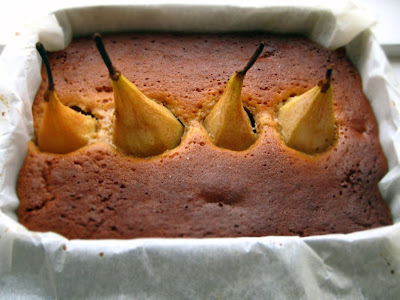 This cake is chewy, almost pudding like in the bottom and around the pears and the warming spice mix is very appropriate for this time of year. Absolutely delicious! 1. Preheat the oven to 350°F. Mix the flour, baking soda, salt and spices, and set them aside. 2. Wash, peel and core the pears. Arrange them standing up in a shallow 2 or 2.5 quart casserole or glass 8″ x 11″ baking pan lined with baking paper (alternatively, you can slice the pears are arrange them in the bottom of the pan, but this looks WAY more impressive). 3. Put the oil, Sucanat, honey and water into a pot, and heat gently, stirring constantly, until the honey and Sucanat are melted. Let cool, then add the vinegar and beat in the egg. 4. 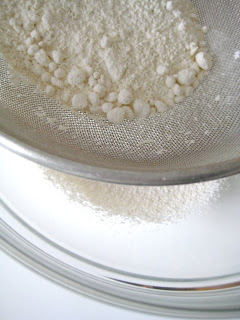 Sift the dry ingredients together in a large bowl. Add the wet ingredients that have cooled. When you have a smooth, thin batter, pour it over the prepared pears, making sure it is evenly distributed. Bake for 35 to 40 minutes, until it passes the old toothpick test. Serve warm or at room temperature. This cake is a total wow when you serve it to your guests, or to yourself, still in the pan, in the middle of the night when you can’t sleep because you can’t get that grating George Michael Christmas song out of your head (it makes me want to cry). I know it looks intimidating, but just turn off the television for 30 minutes and watch a simple miracle materialize. Happy Holidays everyone! I will be back in the New Year. If you do not have any oil on hand can you sub for melted butter or olive oil? What did i do wrong?! Mine turned out terribly. Dense and tasteless ); i don’t think i’m cut out for baking! I made this cake yesterday for my daughter’s first birthday with one tiny substitution: I used replaced 1/2 cup spelt flour with 1/2 cup barley flour. The cake was so delicious and every crumb was gone within about seven minutes of singing ‘Happy Birthday’! Everyone loved it, including the birthday girl! Thanks for this simple and delicious recipe! Can coconut oil be used in place of the sunflower oil? Hi Anon – yes, a loaf pan should work. Just keep it in the oven a bit longer perhaps to account for the depth difference. oh goodness, this looks delicious! what are your thoughts on baking it in a loaf pan? I’ve been a recent reader of your blog and love the recipes!! I chanced upon this one for some holiday baking and was wondering what I can use in place of the egg?